This post was updated on April 2, 2015 to include the full presidential ranking data. As Presidents Day approaches, so too does our annual reflection about our greatest presidents and how our current chief executive stacks up against them. Although much of this commentary is of the arm-chair analyst variety, a recent cottage industry of systematic investigations has emerged. Famed Harvard historian Arthur Schlesinger Sr. deserves most of the credit for the advance of this knowledge, thanks to his 1948 effort to poll the nation’s top historians for Life magazine. Subsequent polls took place in 1962 and 1996, with his son, Arthur Schlesinger Jr., lead the latter investigation. Today, there are numerous additional examples, with each survey utilizing its own methodological approaches. Given the diversity of approaches, the relative consensus of these studies’ results can be surprising. 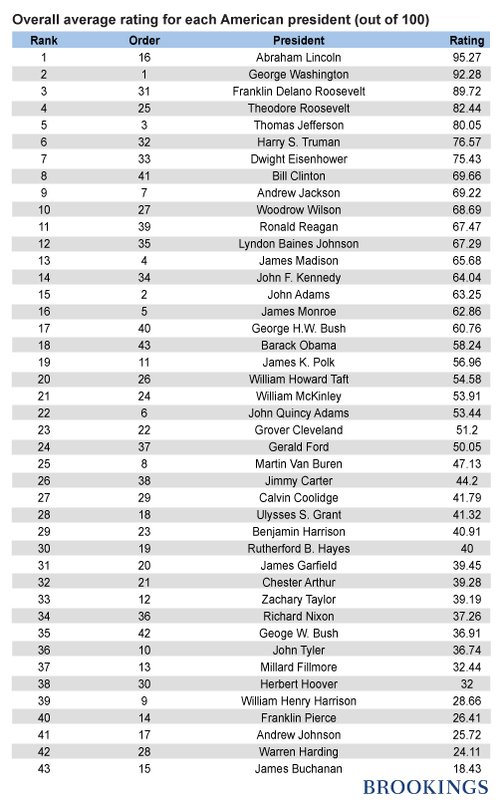 The top tier of greatness polls consistently reports the same handful of presidents—Lincoln, Washington, and Franklin Delano Roosevelt, followed closely by Jefferson and Theodore Roosevelt—while the bottom of the list also exhibits continuity, with names such as Harding, Buchanan, Pierce, and Hoover consistently among the most ignominious. Scholarly perspectives have showed less variance, partly a function of being less subject to the over-exuberance of regular citizens in the early days of the Obama presidency and, so far, less disappointment by his performance in the years since. Even so, there is limited evidence of a slight decline in expert perceptions of the 44th president’s relative greatness. The earliest major scholarly poll that included Obama was a 2010 Siena College Research Institute survey, which ranked him as the 15th greatest president. A 2012 Newsweek survey rated him as the 10th best since 1900 and a History News Network survey of historians gave him an overall B- grade in 2013. Statistical mastermind Nate Silver’s metaanalysis of multiple scholarly polls placed Obama at #17, just behind John Adams and before Bill Clinton. We decided to conduct our own, original poll of several hundred members of the American Political Science Association on the topic of presidential greatness and President Obama’s current place in history (more on the methodology below.) The results of our survey of political scientists with expertise in the American presidency include findings similar to other such polls and some intriguing new evidence, as well. First, President Obama ranks 18th overall, but beneath the surface of the aggregate figures lurks evidence of significant ambivalence. For example, those who view Obama as one of the worst American presidents outnumber those who view him as one of the best by nearly a 3-1 margin. Similarly, nearly twice as many respondents view Obama as over-rated than do those who consider him under-rated. One area where there is significant expert consensus about the president, however, concerns how polarizing he is viewed as being – only George W. Bush was viewed as more a more polarizing president. Next, Obama does not perform well on more specific dimensions of presidential greatness, often viewed as average or worse. For example, he is the midpoint in terms of both personal integrity and military skill (e.g., 10th of 19 in both categories), but falls to 11th when it comes to diplomatic skill and 13th with respect to legislative skill. Even so, when asked which president should be added as the fifth face of Mt Rushmore, Obama ties with James Madison as the 7th most popular choice. What can we take away from this? First, it is easy to infer that scholars and the public alike expected greatness from Obama early on and awarded it to him prematurely. Compare, after all, the fact that Obama’s first ranking in a major greatness poll was at #15; one must go back a half-century to Lyndon Johnson to find a president who entered the rankings at a higher number (#10), and LBJ was a well-known figure on the national stage who entered office after the national tragedy of his predecessor’s assassination. Second, scholars seem to hold Barack Obama in high regard personally, but view his skills and performance as mediocre to poor. Few think of Obama as an excellent president, while many more rate his presidency quite low, with the bulk of experts appearing to give him a passing grade but not one that would get him on the Dean’s list. It could be worse for Obama, of course. Barring unforeseen scandal, he’s unlikely to become significantly less popular, and as he enters his post-presidency, he is likely to experience the same slow rise up the greatness polls George W. Bush has had. Whether that is a sluggish climb or more noteworthy, as the case has been with Truman and George H.W. Bush, remains to be seen, but there is still plenty of time left in his presidency to lay the foundation for future claims on the empty spot to the right of Lincoln on Mount Rushmore’s granite façade.